afterimage, the Gallery’s after-hours art party, returns to Charlottetown this Saturday, September 29, from 9 p.m. to 1 a.m. The Gallery will be transformed into a multi-level living, dancing hive of creativity. Expect signature cocktails, dancing, sculpture and video installations, live music, guest DJs, games, and more dancing. 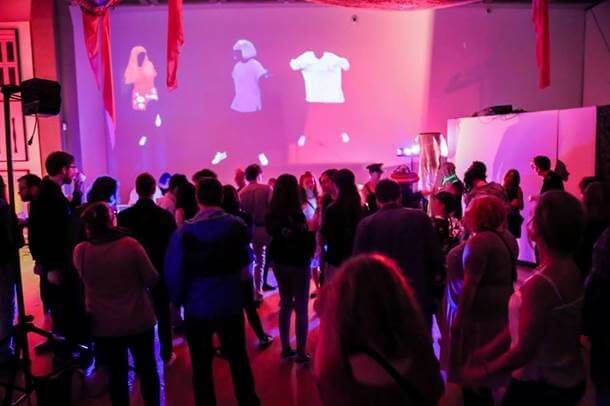 Guest DJ Will Yarr of Halifax will set the beat, while ridiculous costumes, projections, and the ever-popular Spinning Wheel of Fortune Cookie will intrigue partygoers around every turn, occupying all levels of the Centre gallery. Among other light-hearted activities, there are even rumours about carpentry! The event includes an interactive video game, and work by artists Kelly Caseley, Pascal Dufaux, Rebecca Ford, Ian Funke-McKay, Evan Furness, Eric Gaucher, Sandi Hartling, and Mikey Woz, among others. Tickets be purchased at the Centre box office or via confederationcentre.com, or at the door. Patrons must be 19 years of age to attend.